Open Hand provides home delivered meals to individuals with health issues, health counseling, and volunteer facilities. 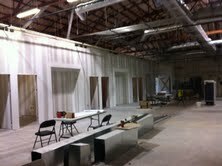 The campus expansion provides the ability to provide over 20,000 meals a day. The previous facility was 13,000 square feet, the new campus expanded the facility to 33,000. The project consisted of : developing a project masterplan, site plan, design and programing of the offices, production kitchen, food packaging, volunteer spaces, food packaging, food storage, coordination of all consultants (MEP, Civil, & Structural), construction documents, interior finish documents/ specifications, coordination of project signage, fundraising documents, coordination of permit documents for the City of Atlanta, & construction administration.